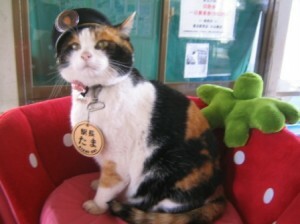 Charismatic Station Master Cat, TAMA ! 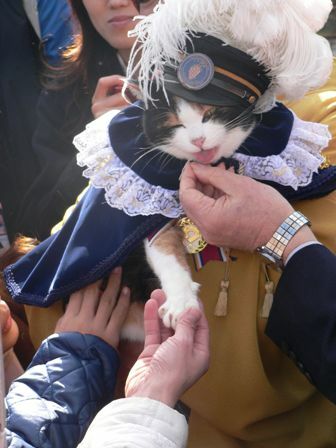 While many people have lost their job during this recession, there is a cat who was officially installed as a station master in Japan. Since 2007, Tama, the station-master cat has been working at Kishi station in Kinokawa, [W:Wakayama Prefecture]. Tama is a cat of a kiosk in the station, and the other calico cats and she have been always the stars of the station. She surely does her work right. After she was installed, the sales of the railway company increased because many tourists visit the small station to see Tama and buy the various merchandise of Tama. There is even Tama painted train!